The Brunswick Fanatic SS boasts to have a strong symmetric core (that is what the SS stands for). This ball takes the Dual Flip Symmetric Low RG Core and pairs it with the Relativity Hook Coverstock to offer a ball has a fast-revving ball motion with easy length, a strong mid-lane traction as well as awesome continuation and great hitting power on medium to heavy oil conditions. Likes:I really like how this ball reads the mid lanes but still has a ton of hitting power. It kinda reminds me of the Melee Hook, but creates a little more angle down lane and is a little sharper off the spot. Dislikes: It may end up being too strong for some rev dominant bowlers, but overall i think it'll be great for league bowlers and tournament bowlers alike. The Fanatic SS is SUPER STRONG. The SS is a strong symmetrical and the strongest in the Fanatic line. The SS reads the midlane about 2 feet sooner than the Melee hook and has more continuation on the backend. If you are looking for a strong symmetrical, the Fanatic SS is the ball for you. A great addition to the fanatic series. They have the skid flip in the original, the smooth urethane in the btu, and now the smooth heavier roll in the ss. Great ball for the fresh when the backends are strong when you need something to slow down. It's a good 2 feet earlier than the original fanatic. This ball really shines when you want to keep your angles closed and go up the lane. ***The opinions expressed are solely those of the writer and not of Brunswick Corporation. I drilled the Brunswick Fanatic SS to be the third most aggressive, mid lane ball in my bag, behind only the Mastermind Strategy and Forest Green Quantum in overall hook, and it has not disappointed. With the 5.5” x 30* drill pattern, the pin ended up above my bridge. I did not need a weight hole, but have room to place one if I want to tune the reaction. I have used the Fanatic SS on a couple of lane conditions. I will post them below, as well as a brief synopsis of how the ball performed. As you would imagine on a typical house shot (THS), I was able to play inside and create a lot of area with the Fanatic SS, with a good amount of “miss room” inside of target. The great thing about the Fanatic SS is that I am able to keep migrating further into the lane with my target and my feet and still have good pin carry, which is not always true of other, mid to high end, fairly aggressive symmetrical core balls I have reviewed and used in the past. Being on the left side allows me to stay further out longer, but having the ability to move inside and know you can carry is a valuable tool for all bowlers to have, and the Fanatic SS gives me that peace of mind. I wasn’t a fan of the box finish on the THS, I found it to be too early of a roll for me. I took the cover to 1500 with Royal Compound and with less traffic on the left side, this surface was absolutely incredible on this ball. It allowed me to play more angle further out while actually INCREASING my carry percentage over playing less angle inside without the polish on the ball. This ball takes very well to surface adjustments and do not be afraid to tune it to the specific shot on the lanes, the Fanatic SS can handle it beautifully. I found the Fanatic SS had better pin carry further inside than my Forest Green Quantum with both at box finish, but carried a little worse than the Forest Green Quantum when I played further outside in the drier part of the lane at box, but carry was a push for both with the Fanatic SS polished. The heavy mid-lane rolling nature of the Fanatic SS means it needs a little more oil up front to let it show its true potential. This 40ft. Challenge Series pattern proved to be a very interesting pattern for the Fanatic SS. I tried it on the fresh at box finish and surprisingly really liked the look I got. I was able to play 15 to 10 and move in as the pattern transitioned, keeping pin carry the same as I moved. I then used it polished at 1500 w/ Royal Compound and found that with 40ft. of oil and the semi-high gloss finish, the Fanatic SS was getting a little spotty of a read to get consistent pin carry. But, I bowled a (5) game tournament block on the pattern, and by midway through game three, I was able to get further inside with the Fanatic SS and found a very nice ball reaction. Where other balls were laboring to get back to the pocket, the Fanatic SS was at a straight 1500 sanded cover stock prep, and had no problem getting there. This was very impressive to me, and then having the polished Fanatic SS to go to later in a block when others were starting to struggle with pin carry and angle to the pocket, gave me a leg up on other bowlers. The Fanatic SS will be my go to ball going forward on carry down and late block adjustments when I need to get further inside without having a ball over react. This ball is all about a nice, heavy roll. In closing, I would like to thank everyone at Brunswick Bowling for making another winner. Brunswick truly has the best, most versatile lineup around. Showing what the Brunswick Fanatic SS can do across a couple of different oil patterns, from THS to Challenge Series patterns, will help bowlers see the versatility of the Fanatic SS, and just how easily this ball can be used on a wide array of conditions. It is the first ball out of my bag on medium-heavy patterns, and also when the lanes break down, I grab the polished Fanatic SS, move further in and have fun. I hope you enjoyed my review of the Brunswick Fanatic SS bowling ball, good luck and good bowling everyone. Go get your Fanatic SS today! The Fanatic SS is the stronger predictable brother to the Fanatic and the Fanatic BTU. It has an earlier roll than the Fanatic with far more hook than the BTU. This is a great house shot or sport shot ball for when there is a good bit of lane oil present and you want to play that straighter angle. I find that it is a little earlier than my Forest Green Quantum and covers a few more boards on the fresher slicker conditions. With its quick revving forgiving symmetrical core, lower rev players will surely love the earlier roll this ball provides. Stronger handed players are also likely to love the control that this ball gives at the breakpoint. If you’re looking for a stronger rolling symmetrical ball with loads of value, checkout the Fanatic SS! The Fanatic SS was what I’ve been waiting for as I felt I was missing a strong symmetrical ball and it doesn’t disappoint. The Fanatics SS is a great bang for the buck! It’s great when there is medium to heavy, medium to long oil patterns and when you need good control on the back ends. For a sanded ball this ball does get down the lane very well. I feel that it is a touch earlier than the Forest Quantum, but I think that has a lot to do with the RG. This will be a great ball for bowlers with lower revs and/or fast ball speeds. 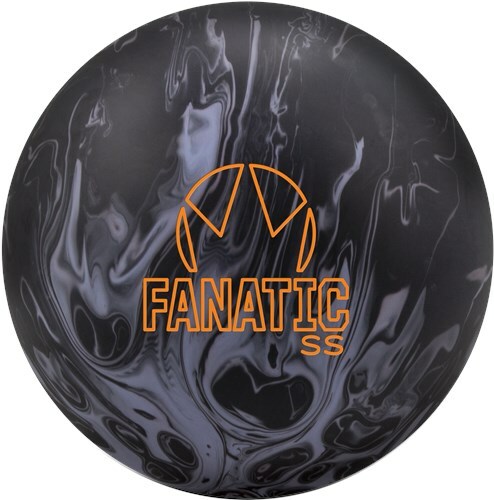 If you’re looking for a super strong ball, look no further…….here’s the Fanatic SS!!!!! This ball is a bit stronger than the Quantum Forest, but I feel like it gives me a better arc shape where the forest was more straight line and then bangs into the pocket. This ball is very clean and has no issues going through oil and coming back off the spot. This is a great ball if you're looking for a strong symmetric ball. Likes: Drilled the Fanatic SS pin below bridge with cg kicked out about 1/2 inch, no weight hole needed. For me this ball is a mid lane beast. Ball picks up in mid lane and just turns and rolls, nothing jumpy about this ball. Strong and continuous. On the Sport conditions that I tried it on, the first was long and had to put it up to start with my Pitbull. By about half way through the 2nd game, I was able to use this ball and stay with it for the 5 game set. Saw the same type motion I got on THS, just strong, continuous, and controllable. Dislikes: OOB on drier THS shots you will have to change the surface as the OOB is a little much. Glad my THS has some oil. This ball for me reads the mid lanes very well and has very continuous motion all the way until the ball clears the pin deck. I find this ball very useful when I am looking to keep my angles a bit more in front of me while keeping my ball speed up. My carry has been exceptional and this last weekend I was able to use it during a tournament and shot 762 in Doubles. This is a ton of ball for the your money and it is a ball that will be very good on tougher conditions being it is strong but very controllable. I can see this ball keeping me out of some split troubles early on in blocks on tougher shots. Hope this Helps!!! Team Brunswick! Turbo Driven to Bowl! 4.5" pin high with OOB finish. The Fanatic SS has been my first choice on fresh patterns, especially when I want to keep the swing to a minimum. The patterns I used it on were medium oil, so after a game or two I put it back in the bag. It has a smooth reaction off the back that won't get you into too much trouble. Once the angles open up a bit I like to switch to the Forest Quantum. Page created in 0.819 seconds with 22 queries.